In China, players started to come back to the market late last week following the week long National Day holiday, that was celebrated between October 1 and 7 as reported on www.ChemOrbis.com. Although players have been taking their time to resume their operations, export PET prices have already started to be voiced with increases. 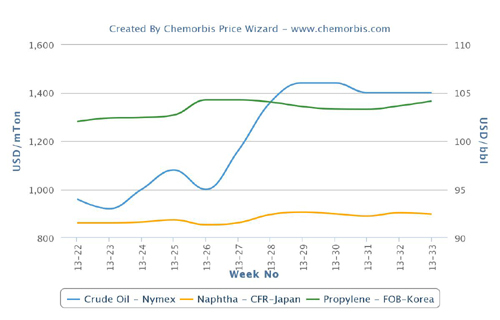 Chinese PET prices on FOB basis indicated $20-40/ton increases from pre-holiday levels. Recent increases in production costs played a role in the higher export PET prices. In the upstream market, spot PTA prices gained $30/ton, MEG moved up by $40/ton and PX rose by $50/ton during this past week. For MEG, the buying interest was reported to have improved after the week long holiday in China. However, for PTA, although prices are firmer on a week over week basis, there are some upcoming plant restarts in Asia which could put a cap on the increasing trend. China’s Prosperity Jiangyin Petrochemical is planning to restart its 600,000 tons/year PTA plant in eastern Jiangsu on October 12. The plant was shut on October 1. Meanwhile, the same producer is aiming to launch a new PTA plant at the same site with an expected capacity of 2.2 million tons/year. China’s Hengli Petrochemical is also mulling over restarting its new 2.2 million tons/year No. 3 PTA plant at Dalian on October 18 after a two-week maintenance. The plant’s operations were halted on October 5. China’s Zhejiang Yisheng Petrochemical’s 2 million tons/year PTA plant at Hainan is expected to resume operations on October 20. However, while restarting their Hainan plant, the company plans to shut their 3.75 million tons/year Dalian PTA unit in December for two or three weeks of maintenance. A Chinese PET producer reported, “Due to the higher PTA feedstock costs, we lifted up our export PET prices. At the moment, we are not getting many inquiries as most players have already stocked up before the holiday. However, we expect PET prices to carry on with their increases until the beginning of November since the PTA supplies are still quite tight.” According to him, the recent upward fluctuations seen on crude oil prices also played a role in the increases.